Wow – this pregnancy is going fast! I’m already over halfway through! If you’re a mom of two, did your second pregnancy seem to go super quickly too? My size: I double-checked my blog from last time, and I had gained exactly the same amount of weight at this point as I have now (8 pounds). I also have finally started showing to the point where the rest of the world can tell that I’m pregnant and not just think I ate a little too much over the holidays. Exhaustion: Oh man, am I tired ALL the time! I’m even more exhausted this time around, but I’m pretty sure that’s bc I’m chasing a 1 ½ year old around. Last time, when I was tired, I could just take a nap. This time, little Miss G will come over and grab my hand and insist I come with her wherever she wants me to go. Nausea: Fortunately, now that I’m well into 2nd trimester, the nausea seems to have subsided. I definitely had a lot more nausea this time around than I did last time. When I was pregnant with G, it seemed that any nausea was really triggered by hunger. So I could just eat something (anything) and the nausea would go away. That was definitely not the case this time. When I was nauseous, I would eat to try to make it go away, but it would persist and then I would just be nauseous and full. Food: I am hungry ALL the time. Just like last time. However, I don’t seem to like the same foods as much. Last time around, I could eat mac n cheese every day and not get bored of it. I think I did eat a green apple every day – usually with some cheese & crackers. I still like those foods, but they’re just ok, not something I necessarily prefer over all other foods. This time, I seem to like beef a lot better than chicken. I am craving fruit more than usual. Last time, the weird food that I all of a sudden liked (which I had always hated) was mustard. This time it’s salt & vinegar potato chips. I usually detest salt & vinegar potato chips! Don’t ask me why, but for some weird reason, they all of a sudden taste good to me! It’s so weird! Baby movement: This baby has definitely started kicking! And, looking back at my blog, it seems like I started feeling the movement on pretty much the same schedule as last time. I just was able to recognize the feeling as soon as it started. This baby (so far) seems to be on more of a schedule than G was. There are certain times of day when I’m almost guaranteed to feel it kick, whereas with G, I never knew when she would be active. We’ll see if that continues or not. But it’s an interesting observation. I’m also curious to see if this one gets hiccups as much as G did – though I won’t be able to feel that for a while longer. Aches & Pains: I have started to feel some of the back pain that I experienced last time. I’m hoping to stay even more active this time than last time, which will (hopefully) help with the back pain, even though I know there’s only so much one can do to prevent it. Last night I got my first foot cramp of this pregnancy. I remember getting foot cramps and Charlie horses throughout the last pregnancy and had kind of been wondering when they would start this time. Guess I better start eating some more bananas! 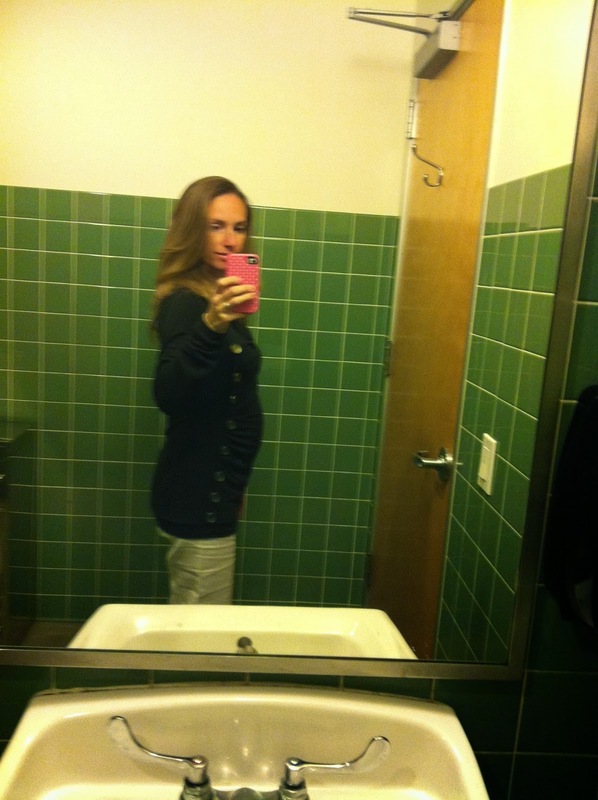 Obligatory bathroom selfie of the bump. Mom/dancer/actress/lawyer/wife. This blog is about my adventures in mommyhood and beyond! Brenda Stevens Sherry. Simple theme. Powered by Blogger.